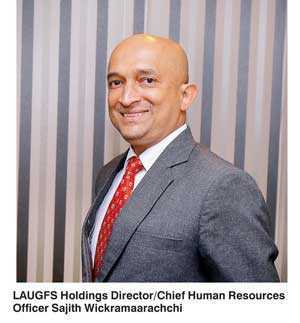 LAUGFS Holdings, the diversified Sri Lankan conglomerate, recently appointed Sajith Wickramaarachchi as the Director/Chief Human Resources Officer to steer the Group HR function. Sajith joined LAUGFS Holdings from Ceylon Biscuits Limited, where he held the position of Group General Manager Human Resources. He has also held senior management roles in a number of local corporates such as Ceylon Tobacco, Virtusa, MAS and Brandix. He holds a distinguished career spanning over 30 years, sharpened by business insights and expertise gained both locally and overseas from several prestigious institutes such as the National University of Singapore, Productivity Standard Board of Singapore and JASTICA – Japan. He has pursued a Master of Business Administration in Human Resource Management from the University of Colombo. “The wealth of experience Sajith brings into LAUGFS will be a valuable addition to the group. As we continue to strengthen our presence and expand our footprint both locally and internationally, strengthening our human capital will prove invaluable to our journey. We are delighted to have Sajith as part of our LAUGFS’ leadership team and I am confident that his business acumen, insights, expertise and exposure of over 30 years will contribute tremendously towards realising our ambitious growth plans,” commented LAUGFS Holdings Chairman W.K.H. Wegapitiya. Over the past 20 years LAUGFS has rapidly diversified into over 20 industries as a trusted brand. It has a talent pool of over 4000 professionals driving its varied operations in both Sri Lanka and overseas. The synergies within the multicultural team reflect the strong family values underpinning the LAUGFS workforce, while the company facilitates the right environment for employees to gain the necessary experiences and drive the organisation forward. Supported by a strong, visionary management team, LAUGFS has been growing rapidly since its inception over the past two decades. “Being a homegrown company that has rapidly diversified into a multinational conglomerate over the past 20 years, our LAUGFS family culture has been integral to our growth. We are pleased to have Sajith join LAUGFS Holdings as the Director/Chief Human Resources Officer to provide the necessary leadership towards our employees’ development and nurture them to realise their potential within the LAUGFS family,” commented LAUGFS Holdings Group Managing Director Thilak De Silva.